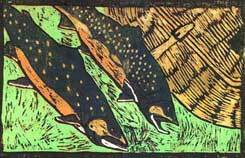 John Koch combines his love of fly fishing with traditional Eastern and Western wood-block printing techniques to produce unique print series . His work is hung in galleries and private collections around the world. You can see many more examples of John Koch’s art on the Trout Lily Studios Web site.